Espressobaren Sorelle: what a difference a girl can make! It was very nice of AP “to squeeze me in” (to use her own words) but as soon as she went to see her mushrooms picking friends, I returned to my original plans to go to Kungsholmen. Kimsy had kindly recommended that I visit Espressobaren Sorelle in Kungsholmen, commenting that the two sisters were delightful. Well, that was a mild way to put it. Espressobaren is a wonderful place. As soon as I walked in, one of the sisters behind the counter greeted me with the nicest smile ever. And what was even nicer? Well, she spoke only Swedish to me. Even after I said that I was coming from Canada and that it was hard to learn the language since everybody here was speaking English. In fact, she suggested – with a nice smile – that I should pretend that I only spoke French and she kept speaking Swedish to me. 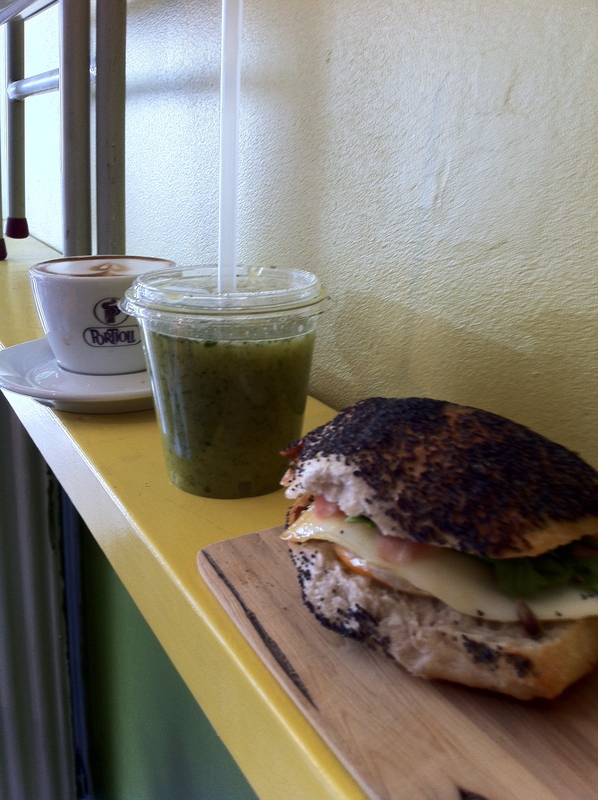 Espressobaren has a wonderful offer of nice coffee, sandwiches, cakes and awesome juices! After having ordered a sandwich and a cappuccino, I noticed juices on display in front of the counter and could not resist have the “green” one. It was orange juice with mint and ginger. Wonderful! 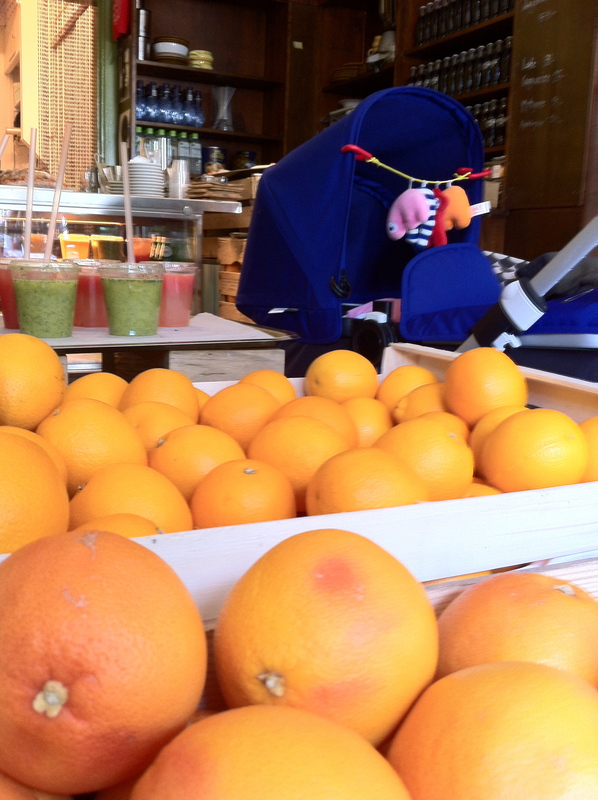 Espressobaren is full of life, with the two sisters singing and dancing when not chatting with customers. There is a large round table in one part of the café which almost made me feel like coming back there just to work…. but that nonsense did not last very long and I decided that I’d rather do my Swedish homework there. This is Kungsholmen after all, not an island where people work on weekends! I like coffe. But I love cafés. And the difference between a good café and an ordinary one will almost always depend on the staff. 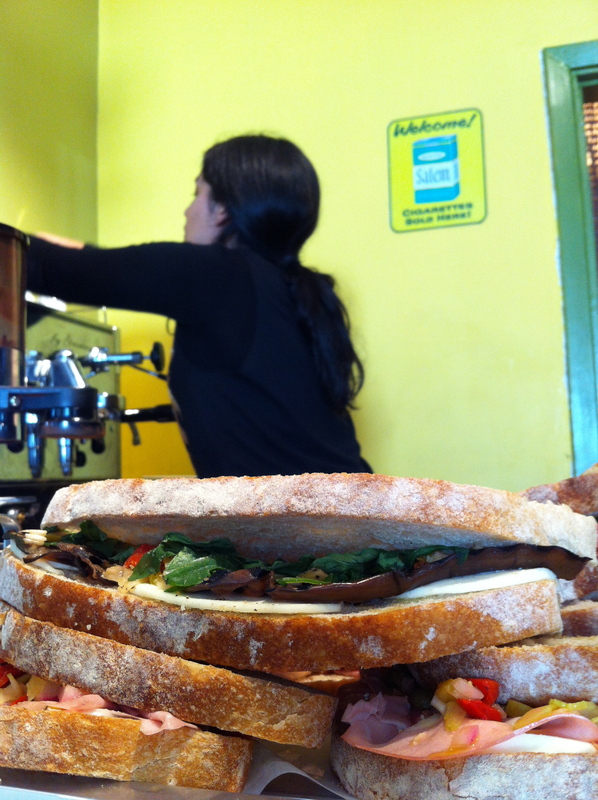 The two sisters at Espressobaren proved once again what a difference staff can make. I am very glad I found Espressobaren today. 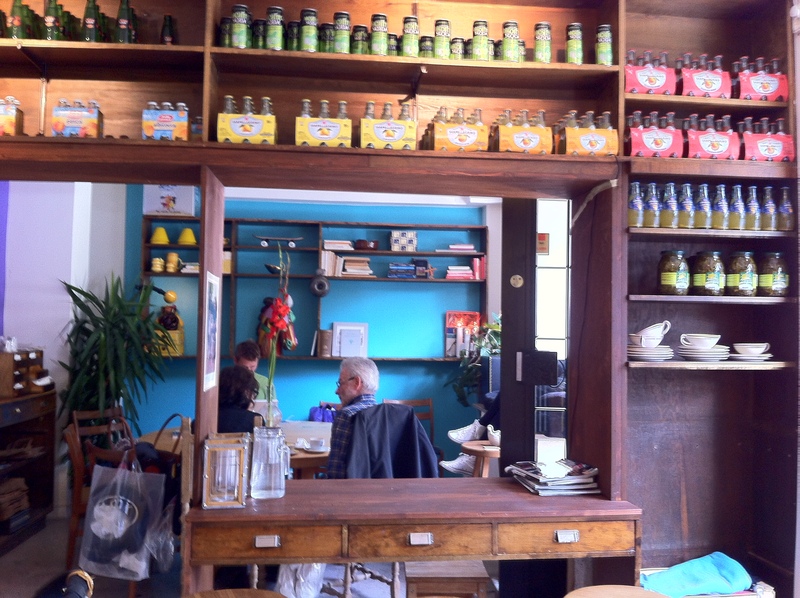 A few weeks ago, Amsterdam – one of my favorite cafés in Södermalm – closed. The guys running the new place (Magnolia – stay tuned: coming to this blog shortly) told me that Edi and Samantha had decided to move to Chile. Amsterdam was that kind of place where I would go to see friends. I have the feeling that Espressobaren could become that new place. Of course, Amsterdam was less than 500 meters from my place. Still, it is worth going to Kungsholmen no matter where you live in Stockholm. The two sisters and the vibe at Espressobaren make all the difference. You should know, however, that the feeling of wellbeing from Espressobaren can affect your judgement. 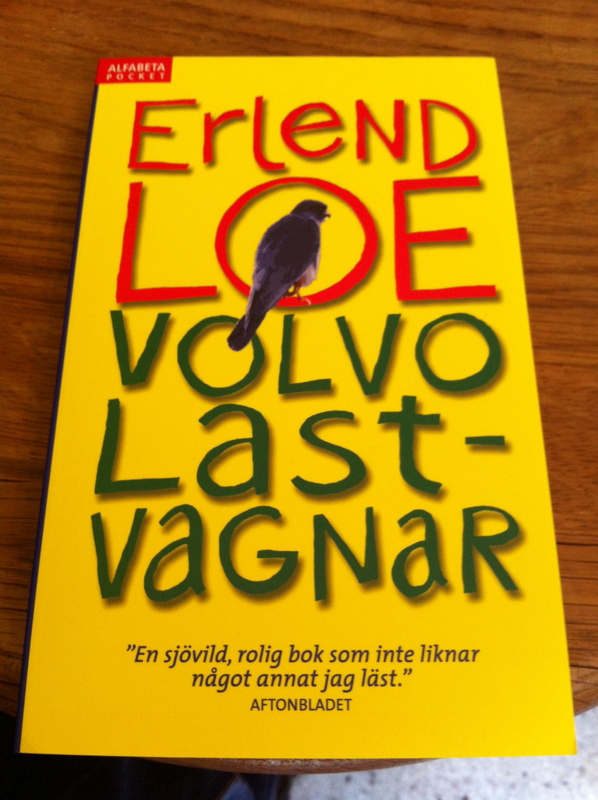 For some reasons, I thought after speaking a bit in Swedish that I was ready to read my first novel in Swedish. Now that I am back home, I am seriously wondering what the hell I was thinking! 15 Responses to Espressobaren Sorelle: what a difference a girl can make! Interesting and nice reportage as always. I need to visit Stockholm soon to have a taste. Did you manage to read the book, by the way, it is in swedish, by a norwegian author. His language is known to be “easy” sort of, but I have read only 1/2 book by Loe until now..
Go for it! Of course you can read a Swedish novel! St:Eriksplan! C’est génial. Il y a plein de bons cafés dans le quartier. Love that first shot…great perspective. Thanks. I like it too. Not too bad considering it was taken with my phone. I really need to start taking my Canon with me when I go to these cafés. Wow… did you eat all that food? And what’s the title of that book for the sake of your English-only reader’s like myself!? And no, I did not eat all that food, even though it was really tempting! Ha! Volvo Trucks. Now that’s an interesting angle for a novel! Stay tuned. I am starting reading it tonight. I suspect it has not much to do with trucks! We shall see … maybe! After four pages, I can say that it has little to do with Volvo trucks. In fact it is more about an old lady who, for some reasons, is not allowed to have birds at home and she is upset with the entire world because of this. I should mention though that her late husband used to work for Volvo…. so there might be a more obvious link later on. Amsterdam was a great cafe, kind of sad, but cool that another will open, and the owners are going to Chile… Very exciting. Definitely can’t fault those seeking adventure!